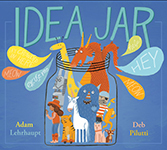 Books by Adam Lehrhaupt, a full list including upcoming titles. Below is a full list of all the books by Adam Lehrhaupt. They have been translated into more than a dozen languages. For more info about Adam, please stop over to the about Adam page. There's also a great place to get more info on Adam's school visits and author appearances, or click here to book him for one. And don't miss out on his great Common Core based classroom activities and other fun book related stuff. Beware! If you open this book, you will let the monkeys out! You wouldn't do that, would you? Someone closed this book! With us inside! Will you help us? Please, open this book. Theodore lives in a cave. A quiet cave. And that's the way he likes it. Until something disturbs his silence. Will he eat it? Some people are great at drawing. I'm not. But I can still make great art. Want to see how? Zoey is a chicken with imagination. And she's decided to go to space. Will you go with her? Sam wants to go to school. So, Zoey makes him one. But what exactly does an imaginative chicken teach? And will Sam ever get pie? Zoey and Sam set off through the snow to find the north pole. Will they find it, or will they find dangerous yetis instead? Verb wants to be the center of attention. But only Noun can be something. How will Verb get what she wants? And who will save Noun when danger rears it's head? The townsfolk have been captured by Evil Overlord. Can Hero and Heroine save them? How will it turn out at The End? If you don't create stories for your ideas they get rowdy and cause all kinds of trouble. Will you help fix it?